It is soft and smooth foundation. It doesn’t mean the name is Luminous isn’t same as Bobbi Brown luminous foundation. When that foundation erases about 12 hours this is better in persistence. However doesn’t work for the skin that gets makeup easily erased. The little bit lack of moisture makes the skin look flawless. 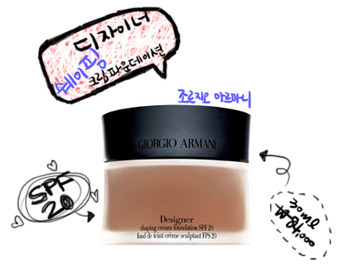 Personally comparing to the Shu Uemura flawless foundation, this makes it more flawless like surface of the vase. This applies only to people who have good skin. It’s not too much of oil or too moisturizing also it’s not even thick or dry. I use #4 but doesn’t exactly matches my skin color. It should be little bit brighter but it just matched my skin so I pick #4. There is barely any coverage. It only covers small blotches and revises the skin. It cleans out the skin very naturally matching the skin tone. This is said to be use for all type of skin but I don't think so. This is great for middle type skin however for the dry type skin instead of being moisturizing, it’s more soft and glossy. It is moisturizing while you are applying but soon disappears after. Like the name of silk it feel like that. Don’t expect to have a moisturizing effect like you are applying basic skin care products. Recommend to only middle dry type, middle oily type, and mixed type skin. I usually use a brush but it will be fine to use your hands. The unsatisfying part is the case! When I try to press it very lightly it tends to press all the way giving too much amount of foundation. Also the biggest problem is that it doesn’t settle onto the face! When you put too much basic skin care products or using glitter primer or matte base that have glitter the foundation comes out like keratins. So have to be careful and apply only enough amount of moisturizer than the problem is solve! When it comes out than take off the coming out foundation and pat it in. However when you keep applying with neglecting it will never settle. I don't have a mind of repurchasing. When it came to my house, it became my first and best foundation. I used it for several months and I know the reason why it became number one. This foundation is popular even though it was so expensive. It is because of having high SPF in foundation. When you apply more than once than you don't need to use sunblock during summer. The coverage isn’t that great but fair enough. It applies really soft and without using a brush is fine. When you are busy, you can just apply quickly. It finishes off not too glossy but just adding light and making the skin look healthy. The coverage is better than Luminous and doesn’t look thick. I thought it would be heavy because it’s cream foundation however it isn’t and I have fair enough amount of oil but doesn't look too glossy. However for dry type skin, it’s far from being moisturizing. When you are too dry skin, than it will be fine without feeling uncomfortable. Recommend to not really dry type, middle, and middle oily type skin. Also when I use Bobbi Brown Luminous it lasts for 6~7hours. I am satisfied with the persistency. Don’t expect for the foundation to shape your face. I don't know why they use that word; it doesn’t even shape your face. I try to mix with other foundation to create the color I want. However the texture gets destroy from the original foundation. So have to use it alone. I really want to recommend to people who match the foundation to their skin shade. Recommend very useful nail polishes!